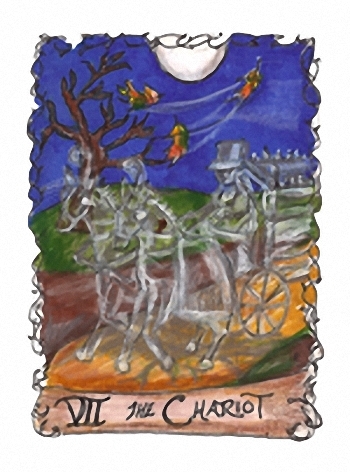 The All Hallows Tarot is a doorway as much as it is a deck of cards. Designed by Professional Dreamer Studio, it is a glimpse into a world much like our own...only not quite as solid, or as real. The images are meant to evoke all things mysterious...the idea that on All Hallows Eve, strange people come out of the dark, and the veils between worlds and realities tend to melt away. It is a deck with a modern feel and energy, and yet still retains a sense of timelessness, a thrilling occult mystery and wonder that shrouds reality. The illustrations are of people that are young, underground: Goths, punks, rebels and performers, with piercings and tattoos... those individuals off the radar, off the main stream, and on the edge. The Autumn People. All Hallows Eve is also a time of remembrance. A lone night for ancient Celts to pay homage to their ancestors. Much like the Dia de Los Muertos (Day of the Dead) celebrated in Mexico a few days later, a day for modern pagans to welcome back the cherished souls of their loved ones, who have gone before them. And finally, The night of All Hallows Eve represents the chilling darkness, the eerie glowing lights from carved Jack O' Lanterns on the porches of the suburban houses. It is the promise of candy from strangers, scary ghost stories told in the dark, the crunch of autumn leaves scattering the sidewalks, and seeing people of all ages lose their inhibitions, to dress up and play. Later, it was the connection to ancient Underworld myths, Wiccan festivities, and Victorian grimoires of divinatory practices, a chance to lift the veil, and glimpse the future on this one special night. You Should Bloody Well Like Us!